The composite piece contains several different articles about the search for and memorialization of Blind Willie Johnson, which demonstrate the importance of research and collaboration. It will also demonstrate how official records did not document black history in the Jim Crow South. Fans have to be prepared to enlist the help of professionals. The very bottom answers their main question. The cenotaph placed in Blanchette Cemetery. "Two Blues Fans Fill in the Gaps of Blind Willie Johnson and Get Historical Marker Approved" - Jazz News - February 18, 2010. It all started with the music. His voice came from a place unknown, it was a low growl that powerfully came from the depths of his throat. His sound, his words, soul-reaching and stricken with alms for the Lord and the weary stuck in the hearts and minds of all those who heard him. 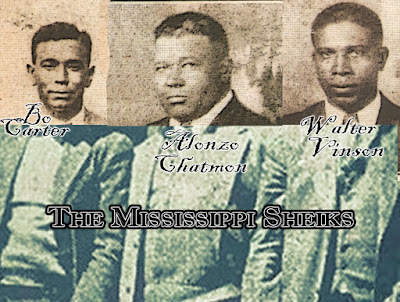 From the mid-1920s, Willie Johnson played the streets of Marlin, Temple, Waco, and later Beaumont, Texas. He generously shared his talent with the world, to whomever might listen, standing there holding his guitar, with a tip cup hanging on the neck, playing bottleneck slide. "Blind" Willie Johnson can be considered one of the first true troubadour's of blues and gospel music in modern times. He led the way for other musicians who would famously call the road their home. He had no one, he was alone, and had only his music to share with everyone he came across in his brief life. His life is important to all those who have felt like orphans in this world. His life is a legacy for blues history, gospel history, Texas history, and black history. His life is our history. He traveled from city to city, trying to find a warm bed and meal for the night. And even though his stay in these towns may have been brief, his music and soul leaves a permanent and lasting impact on this world. And here's to those brave people, like Willie, who took a risk to give their talents to this world, even though it may have meant sacrificing an easy life for themselves. In 2007, Anna Obek and Shane Ford began a trip to find the graves of Texas blues musicians. They traveled around the state and the last site they visited was the grave of "Blind" Willie Johnson in Beaumont, Texas. As with the other graves, they had done some research as to where Mr. Johnson was buried. There was not much information to go on. "It is for Willie, and those like him, that we have dedicated ourselves to this cause, " Obek and Ford said. According to Mr. Johnson's death certificate, Johnson is buried in "Blanchette Cemetery" in Beaumont, Texas. There is a lot of confusion as to where "Blanchette Cemetery" is actually located. Finding "Blanchette Cemetery" seemed to be the main question. Anecdotal evidence suggested that "Blanchette Cemetery" was somewhere on Hegele Street in Beaumont. They did have some research experience so they got a map from the Jefferson County Clerk's office detailing the "Blanchette Cemetery". With map in hand, they set out to the edge of the railroad tracks on Hegele Street. They discovered an area in shambles. Instead of locating a grave, there was only a patch of land with broken, rotted headstones, caskets above ground and an unkempt lawn. None of the broken headstones yielded Mr. Johnson's name. After realizing that Mr. Johnson had no headstone, Ms. Obek and Mr. Ford began a campaign to preserve his legacy. They departed Beaumont very disappointed. If Johnson was indeed buried in "Blanchette Cemetery" there was no trace of him now. They decided then and there that it would only be proper for this man who affected them so much to have a memorial. They knew first that they had more research to conduct to make sure the memorial would be placed in an accurate location. They walked Commerce Street in Marlin where Mr. Johnson played and areas of downtown Beaumont in order to find out more about Mr. Johnson's life. For the next two years, they began collecting documents from the Jefferson County Clerk, obtaining maps and deed documents, as to gather more information on "Blanchette Cemetery". As is turned out, there were several "Blanchette Cemeteries." Time continued on, with little to no results, as to his exact burial site. It seemed impossible, due to the fact that the graves were shallow and with the storms that had come and gone, caskets were known to travel. In 2009, their newly gathered evidence proved which one of the "Blanchette Cemeteries" Blind Willie was buried in. 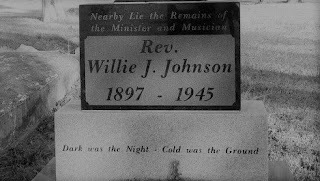 Several deed records were located that traced back to multiple owners and maps of the cemetery in question, some of which included the people who coordinated "Blind" Willie Johnson's burial. Still, there was not an exact plot. At the time, the Jefferson County Historical Commission was working to submit an application for a Texas Historical Marker for Mr. Johnson. Ms. Obek and Mr. Ford contacted the JCHC and suggested, since there was no exact plot found, to have a marker where "Blind" Willie Johnson lived, the last location listed on his death certificate, the "House of Prayer" at 1440 Forrest in Beaumont, Texas. The Jefferson County Historical Commission reviewed their evidence and agreed and since have submitted this application to the main commission office in Austin. In February of 2010, the Texas Historical Commission approved the "House of Prayer" location. The marker will be erected in late 2010, early 2011. Along the way, Ms. Obek and Mr. Ford also uncovered the mystery as to who Angeline Robinson was, Mr. Johnson's alleged wife. The information they found was discovered in old Beaumont City Directories and U.S. Census data. It is known that Angeline Robinson was the sister of blues guitarist, L.C. Robinson. The U.S. Census data lists an L.C. Robinson in 1920 as age five. L.C. Robinson was born in 1915, thus, making him five years old in 1920. One of the sister's listed is Anna Bell Robinson, age twenty. According to Beaumont City Directories, in 1941, a W.M. Johnson and Anna Robinson resided at 555 Forsythe Street (St. Charles Hotel). After Willie's death in 1945, the Beaumont City Directory of 1947 lists an Anna Johnson (wid of Willie) living at 1730 Cottonwood in Beaumont, Texas. Due to this evidence, they believe that Angeline was born Anna Bell. After speaking with Anna Bell’s daughter, Mr. Ford and Ms. Obek were made aware that the daughter did not want her information to be released and asked that they respect her privacy. Due to this, they are unable to release her mother’s death certificate at this time because it contains the daughter’s name. They believe that this is the right decision to make for the sake of Anna Bell’s daughter and due to the fact that they do not believe that she is the daughter of “Blind” Willie Johnson, rather the daughter of Anna Bell and another man. Through their evidence and through the daughter’s information, they were able to verify that Mr. Johnson was not her father. Temple seems to be an important city in “Blind” Willie Johnson’s life. It was first thought that Johnson was born around Temple. The evidence Mr. Ford and Ms. Obek have uncovered seems to point in that direction. In 2007, an article in the Austin-American Statesman, states that Jeff Anderson located a 1918 draft card for a blind man named Willie Johnson who’s father, Dock Johnson, lived in Temple. The evidence Mr. Ford and Ms. Obek found in Bell County, through the U.S. Census in 1910 and 1920, lists “Doc Johnson and wife Catherine.” Although none of the children listed are named Willie, there is a son named Robert. In Samuel Charters initial findings, it was said that Willie had a brother named Robert. In the Temple City Directories for 1915-1916 there is a listing for a Doc Johnson (wife Catherine) at 316 West Avenue D in Temple, Texas. In the same directory and year, there is a Willie Johnson as a boarder at the same address. Mr. Ford and Ms. Obek also found a listing in the 1935 Temple City Directory for a Willie Johnson with occupation as musician at 308 South 5th Street in Temple, Texas. 308 South 5th Street in Temple is within 200 yards of 316 West Avenue D where Doc Johnson lived and a Willie Johnson was living at one point. Ford and Obek visited both locations in February of 2010 and all the buildings are gone and replaced with construction and storage businesses. Shane Ford wrote a book entitled Shine a Light: My Year with Blind Willie Johnson. "Jack Ortman Finds the Grave of Blind Willie Johnson?" by Sherry Koonce - Beaumont News June 13, 2010. Nestled among the rows of non-descript frame houses dotting Beaumont's Pear Orchard community lies what an Austin musician believes is the unmarked grave of a man whose life was anything but ordinary. After months of research, Jack Ortman’s search for Blind Willie Johnson's final resting place ended in tiny Blanchette Cemetery, off Hagel Street. There, among the green grass growing on unleveled ground is the pauper's grave of the Texas-born blues master. Local historians have started the process to honor Johnson with a marker befitting a man known as the greatest slide guitarist of all time. Johnson died in 1945 in Beaumont following a bout with pneumonia. Johnson sang gospel and the blues. His songs have been recorded by musical greats such as Bob Dylan, Eric Clapton, Paul McCartney, Led Zeppelin, the Rolling Stones, White Strips, Bruce Springsteen, Hot Tuna, the Grateful Dead, just to name a few. More than 30 years after his death, Johnson's most acclaimed recording of "Dark was the Night, Cold was the Ground," was included on a Sounds of Earth record launched into space onboard NASA's Voyager One. Nearly 60 years after Johnson's death, Beaumont guitar legend Johnny Winter called the song one of his 10 favorite songs in a "Guitar World" interview. As musically-gifted as Johnson was, perhaps it should not come as a surprise that Johnson's grave is as invisible to others as the world in which he lived. In death, as in his childhood, his life was heartbreaking. When just 7-years-old, Johnson's step-mother blinded him with lye-water aimed at his father while the couple argued. "He never did get any kind of gravestone; this is kind of in lieu of the marker he deserved," Ortman said during a telephone conversation Thursday. For the last year and a-half, Ortman said he has searched for Johnson's grave. "I am a student of the music of Southeast Texas, and came across some books that said Blind Willie Johnson lived in Beaumont during the 1930s and 40s, but nobody knew where he was buried," Ortman said. Others had searched before, but gave up the search before finding the grave site. 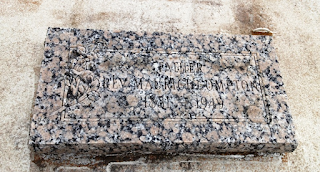 After reading an article in the Austin American Statesman by Michael Corcoran, and a chapter in Corcoran's book, "All Over the Map," Ortman learned that Corcoran had found a copy of Johnson's death certificate indicating he was buried in Blanchette Cemetery. Ortman said to understand how such a gifted musician could have ended up in an unmarked grave, one would have to look at the world during the 1940s. Americans were still reeling from the economic meltdown of The Great Depression, and World War II was raging. Despite the fact that Johnson was one of Columbia Records best-selling recording artists during the Depression, he did not record for the record company past 1930 when the economy ended his career. Prior to that, he recorded 30 songs between 1927 and 1930. In Texas he became a street-preacher, often entertaining crowds with gospel music and his steely talent on the guitar. He operated the "House of Prayer" with his wife Angelina and continued to perform on street corners until 1945 when fire ravaged his home. With nowhere to go, and little money, Johnson continued to stay in the charred home, sleeping on a water-damaged bed until he became ill with pneumonia. History does not reveal whether he was turned away from local hospital because of his race, or his disability. Either way, he died within a week after contracting the respiratory illness, and was buried by the county in an unmarked grave. Estraleta Sonnier is manager of the adjoining graveyards, and was instrumental in helping with the search for the famed musician’s resting place. Since the original owners of Blanchette Cemetery died without heirs, the cemetery has been in flux, overgrown with grass and weeds, she said. When the company she is employed by, Community Cemeteries, purchased an adjacent graveyard, it was agreed they would assist the county in the upkeep of Blanchette, she said. "There are quite a few paupers buried in this cemetery. If I had to guess, I'd say about 200," Sonnier said. She said there is no way to tell which of the pauper's graves is Johnson's since their are no markers signifying where bodies were buried. Because the actual grave cannot be distinguished, plans are to erect a Texas Historical Marker at the cemetery. Members of the Jefferson County Historical Society are submitting the marker application, Ortman said. Because the process is extensive, Ortman said he does not expect the marker to be erected until the latter part of 2010. The maker will cost about $1,500, which has already been pledged by an anonymous donor, Ortman said. When the marker is ready, Ortman said he plans to host an unveiling ceremony with the Jefferson County Historical Commission. "I just feel this is well deserved, and 65 years overdue. He is a Texas musician who needs to get his recognition," Ortman said. "The time is right to acknowledge him." But Ford and Obek's plans were complicated last year when Jack Ortman, an Austin music historian who had spent years putting together book-length compilations of stories written about the psychedelic rock pioneer Roky Erickson, announced that he had found Johnson’s final resting place. Ortman grew up in Beaumont and returned often to visit his mother; he was a fan of local musicians such as Janis Joplin and Gatemouth Brown and wanted to see Johnson get his due. He had spent more than a year poring over maps and tromping through the town’s old cemeteries. He interested the JCHC in putting up a state historical marker, but the commission told him he had to find the exact burial spot. By July 2009 Ortman had narrowed his search to a 25-foot-by-25-foot unkempt area with no stones at all—located across the street from the graveyard Ford and Obek had been studying. This lot, Ortman believed, was a pauper’s section of Blanchette, and given that Johnson was poor, Ortman figured by a process of elimination that he must be down there. “All the other places have marked graves,” he told me. I followed Ford and Obek across the street as they took me to this unmarked lot, which according to their map is known as Nona Cemetery, not Blanchette. But they had recently encountered another complication: a second Blanchette cemetery (“Blanchette #2”), in the northern part of the city. We drove there too. Again we found teetering stones and many shades of green, as well as the adjoining patch of urban jungle that I wound up exploring. We certainly do have an idea, and we have a plan. In 2018, the Mt. Zion Memorial Fund did its own survey of the evidence and a little independent research and discovered one sure fire way of determining once and for all which cemetery contains his remains. 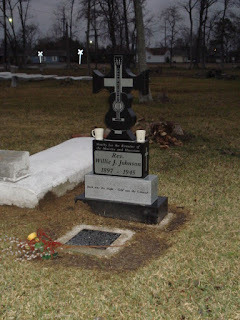 Blind Willie Johnson is buried in the same cemetery where the headstone of Rev. 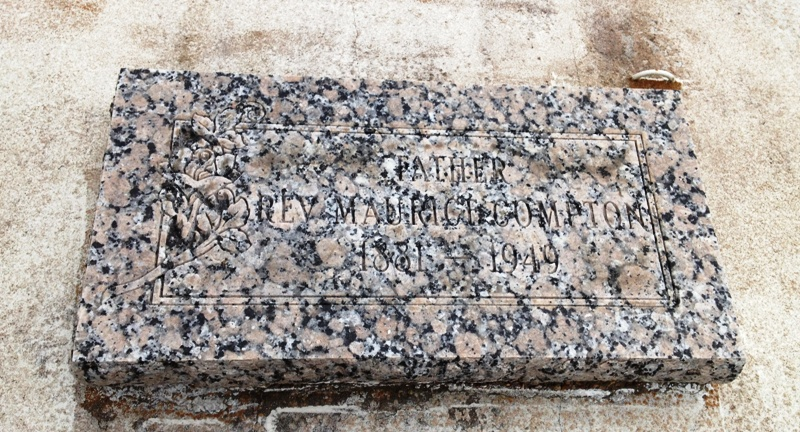 Maurice Compton Sr.'s headstone was placed after his death in 1949. (see, The Pittsburgh Courier, Sep 24, 1949.) Find his grave (pictured below) and somewhere nearby is the plot of ground in which Rev. Johnson was buried in 1945.